Easter Friday came and Chris had already headed down south with a laden car and lots of my gear. It was a beautiful fine day when I met with Tim, Elisha and Rob my team mates. Rob is from Scotland and was the oldest on the team (I believe he is an old mountain marathon running acquaintance of yours Ally?) Elisha is only 19, so he was the youngest competitor in the whole race. Tim was the original founder of the "Go Team" and having down lots of orienteering and rogaining he was the chief navigator for this race. We had a very slow drive down to Queenstown, eventually making it the house we were sharing with another team. We had a couple of days to organise ourselves before the race started on Monday. Logistics were challenging for us, as none of us had ever done a race such as this before. We each had a bike box, and four 'gear boxes' in which to distribute our gear. But each box did not necessarily appear at each transition so you had to make sure you got your gear in the right box for the right stage. After a very busy Saturday we had our boxes sorted and early on Sunday morning we dropped them at the race head quarters. We spent an hour lurking round Queenstown wearing our O gear (mine I discovered to my horror even had hole ripped in the bum!) before hopping on the bus and heading down to Te Anau. 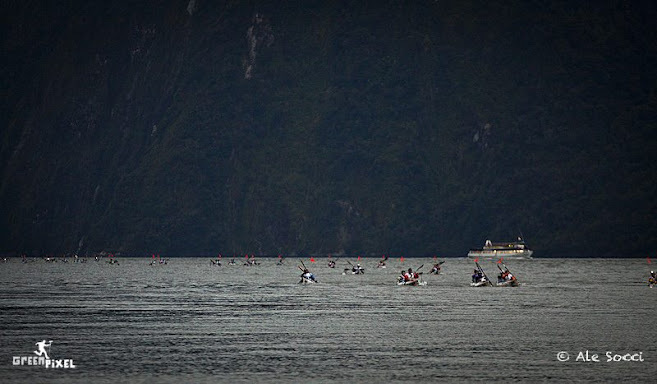 By now we were already pretty sure the race would start in Milford Sound, but it was supposed to be a secret. 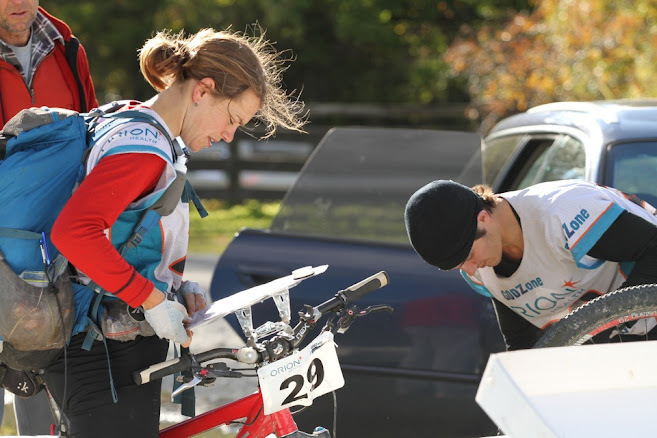 We filled up with pies in Te Anau, and by now we were all starting to feeling pretty nervous as the race start was looming closer. It was nice hanging out with Chris a bit and getting some last minute tips off him as we gazed across the lake. At the start of the Routeburn Track we were finally given our much anticipated 2 sets of maps, and spent the rest of the spectacular trip peering at hundreds of kilometers of map we were about to cover. Our first thought was that there was lots of bush and tricky route finding on the treks - it was going to be a tough race! When we finally arrived in Milford sound we were dropped at our bikes and given half an hour to sort out our bikes and paddle gear, before jumping on the bus for a final time to be dropped off at the Ferry Terminal. Teams had the option of sleeping inside the terminal building, or camping in the domain. We chose to camp in hope of getting an earlier night. Tim and I dived into the tent and spent time planning the maps while the others cooked dinner. Then we all wandered down to the terminal building for the race briefing. By now the race was feeling very real and we would only have a couple of hours sleep before we needed to be up and boarding the ferry by 3 am. I had a very restless sleep I was excited and nervous. Several times in the night Elisha thought his alarm had gone off and started getting his gear packed only to see it was still too early. When the alarm did finally go we were up and ready to go very quickly. We carried our boxes down to the start and then ate as much breakfast as we could stomach in the ferry terminal. The boat ride out to the start was exciting, the Sound was pitch black still and we tried to grab a few more minutes sleep. Eventually the engines slowed and team numbers were called to get on the little boats which would ferry us to shore. The atmosphere was very exciting - it was still dark but the whole shore was lit up with teams scrabbling around finding their kayaks and getting organised. At 6 am we entered the water in our kayaks and headed out to the foot of a waterfall. It was still dark and the sea was quite choppy. There were at least 60 double kayaks bobbing around in the water, lit up by headlamps and the distant glow of the Real Journey's Launch we had been dropped off in. In no time at all the race director had blown a horn and we were off, charging towards the launch. Kayaks were going everywhere and Rob and I got pushed right into the launch itself in the desperate fight to get around the boat and start heading back down the fiord. There was quite a surf and it was a real battle to keep the boat going straight. We kept yelling out to our team mates to try and stay together. Dawn broke as we were about half way down the fiord and the distant terminal building came into view. 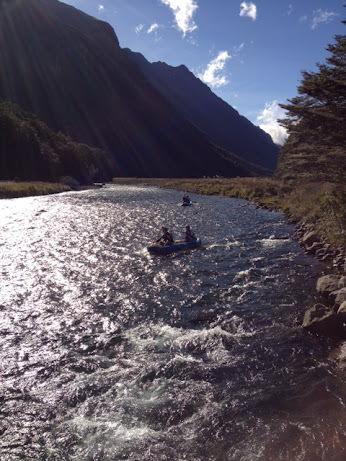 Teams had become more strung out now and it was much more peaceful as we neared the end of the paddle. Some dolphins came jumping out of the water right by our boats. 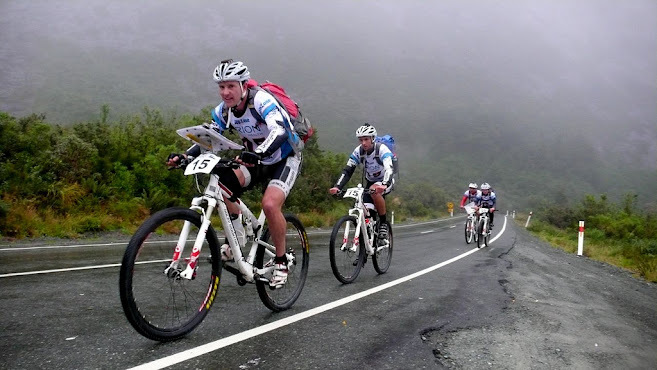 The day was grey and misty, so we piled on a few dry layers before heading off on stage 2, a bike ride up through Homer Tunnel and over into the Eglington Valley. We set off on our own and felt the first real surge of excitement that the race was finally underway. We rode together at a good steady pace picking up a few teams along the way. Tim got a bit of a tow from Rob and Elisha on the last section of the climb, up through the tunnel. Then we emerged on the other side and enjoyed the ride into a bit of sunshine over the Divide and down to TA 2. Now it was time for a canoe down the Eglington River, which was running very low and we needed to be off the river by 7pm before it got dark. We didn't have much skill on the river to begin with, but we slowly started to get the hang of it as we went down. Some of the time we had to jump off and run with the canoes, and one of ours sprang a leak so we had to stop to pump it up. Some teams passed us while we caught up with a few, and after about 6 hours on the river we finally rounded a bend and entered the gorge. The gorge proved pretty straightforward, and as we were floating through the last part of it a small figure appeared on a rock above us and shouted that it was only 15 minutes to the transition which meant we would make it off the river before the cut off, phew we were relieved! At the TA 3 we moved quickly to organise ourselves for the monster trek. We knew it could take 24 hours, so we packed lots of food and heated up some water to eat some Backcountry dinners on our way out. We had a quick gear check as we were leaving, and then we were straight into some very dense manuka scrub which made eating dinner tricky! We lost a bit of time trying to take a more direct route through the scrub and ended up bashing back out to the fence line to try and follow that. I was thinking to myself that Chris would be loving this (how right I was!). By now Chris's team Seagate, Subway and One Square Meal were all some way out the front chasing the lead - they were several hours ahead of us. As it got really dark we found the start of the tramping track we would follow up the mountainside. Lots of teams had overtaken us while we were lost bashing around in the bush and we were amused to overtake lots of them on the hill climb instead - we thought navigation was supposed to be our strong point not leg speed! Up and up we went for what seemed like an eternity. Eventually after some debate with the altimeter and another team we arrived at the marsh plateau where checkpoint number 1 was located. It was a very satisfying feeling to have finally reached the first checkpoint. From there we climbed higher out of the bush and onto a the shoulder of a mountain. The wind had picked up and it was raining a bit so we were wearing all our warm clothes. We traversed through a series of shingle slopes and gullies eventually arriving at the main ridge we needed to descend. Our route choice was to climb over a couple of distinctive hills on the ridge in order to descend a very straight and direct looking ridgeline into the forest. Unfortunately I don't know if we could have picked a worse ridge, the tree fall was worse than I have ever seen. We bashed and grovelled our way down the ridge until eventually it became so impenetrable that we dropped off into the creek - this proved marginally better and at about 4.30 am we emerged from the bush. It was raining and we decided that it was time for a sleep so we put up the tent and crashed inside. Despite lying in a thin bag on a tiny mat I slept very well and felt cold but ready for more when the alarm went off two hours later. We packed up quickly in the daylight and headed down the river. The next control was in a tricky place in the forest which was part of the reason we decided to sleep through the last of the night so that we would reach it in daylight. We followed up a tussocky river bed and then up into the trees again. Our spirits were very good after our sleep and we passed several teams who looked like they had spent the night wandering around lost rather than sleeping. We made a small mistake climbing to the control by taking the wrong ridge, but then we got back on track and after another small correction we were in the right gully climbing to the control. From there we carefully descended the long ridge into yet another river valley. When we reached the hut at checkpoint 6 we were surprised to find we had moved ahead even more places. From the hut we had to continue up over another mountain range. Coming here in daylight meant it was much easier to pick a good route up an enormous scree slope and we climbed steadily as the afternoon wore on. The day had turned out remarkably sunny and we got very hot as we climbed. We reached the top of the range and descended down a much nicer forested ridge than the previous night into the final river valley which lead all the way out to the transition. There was a good track to follow once we got some way down the valley so we made good progress even though it was dark again. The temperature tonight was very cold and we realised we would have to put on lots of clothes for the bike ride. We ate some hot food at TA 3 and took a bit of time to organise oursleves. Tim sorted out some blisters on his feet and in my attempt to help him I strapped his light onto the wrong bike and forgot to put the lid on his bladder! Not so much help really, but I guess I tried. We took off on the bikes eager to set a good pace and pick up some teams along the way. We found a member team Mazda bashing around looking for the first control in quite a panic and helped him find the control. Then we crossed the freezing river looking for a 4WD track which didn't seem to exist. We passed the next few freezing hours biking up the river valley, sometimes on a track and sometimes pushing our bikes through tussocks and matagouri bushes. When we reached the hut with the checkpoint we wanted to have a sleep but the hut was already full so we pitched our tent for a very chilly two hour sleep. I shook so much that it wasn't a very restful sleep. 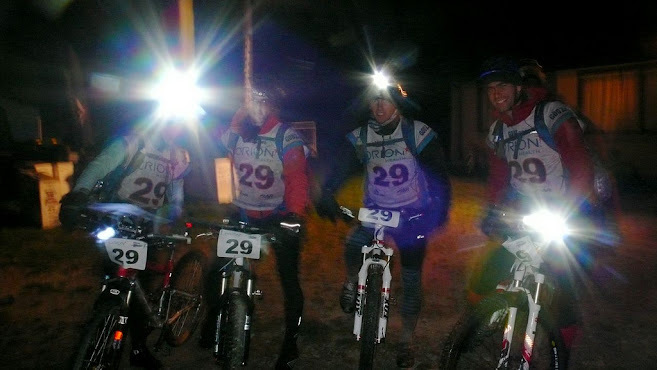 It was still quite dark when we set off so we kept our lights on and bashed up river pushing our bikes most of the way. We had to go on up the river for many more hours and then finally the sun rose and we turned left up a side river and in to the control. Much to our relief the second half of the mountain bike ride was dominated by rideable 4WD roads so we enjoyed a gentle climb and windy traverse. The sun was shining warming us up for the first time. We had a big grunt up to a saddle, whoosh down the other side and then up again very steeply to a pass. Just before we finished the bike leg we took a wrong turn and managed to ride back over the pass we had just crossed. I was very confused when the stream was suddenly running in the wrong direction and Tim and I shared a pretty low moment for making such a dumb navigational error. Back we went over the pass again, trying to put our mistake behind us we arrived in the transition many hours after we had expected to get there - but at least it was still sunny and we had some good hot food and all felt excited about going out on the next trek. We knew this trek was going to be another big one so we put in lots of food, over 24 hours worth. Tim and I had been through some ups and downs with our navigation, but had decided that by working closely together and constantly checking up on each other we had the best chance of not making mistakes. We found the first control down in the stream with no difficulties, so then we had to climb up through the bush for a long way to reach the open ridge. We had a fun time climbing the ridge, we kept finding things which people had dropped as they were going up - we found lip balm, gurney goo, a drink bottle, a packet of crackers and even a small pottle of jelly with peaches! I had a sore throat so that went down very well indeed! Rob, Elisha and I got very sleepy when we were traversing along the ridge. I could only just keep my eyes open and was stumbling along the ridge - I think that the freezing sleep from the night before had had its price. Fortunately we weren't far from the next checkpoint and cozy hut. There was a man at the checkpoint who was keeping the hut warm with a smokey fire and I was so grateful to crash on the floor and sleep. After the other team that was there left we crawled onto the two bunks and got 1.5 hours warm sleep. I felt so much better when we started off again and was back helping Tim with the navigation. In the dark we stumbled around for a while trying to find the right ridge and ended up just taking a north bearing towards the pass we had to climb. By now Rob was having serious issues with his foot, he had strained something in the front of his foot from all the downhill and biking. He was taking lots of painkillers but he was clearly in pain over the rough ground. We had to smash through some thick scrub to get back on course - we had veered slightly to the left of the saddle - and then we climbed up prickly spaniards and tussocks to reach the saddle just as the sun was rising. The sunrise was amazing, absolutely orange sky with sun rays beaming through. We traversed across and then descended a very long tussock ridge which was very slow and sore for Rob, he ended up having to do most of it backwards! As we neared the end of the ridge we spotted a fit looking team marching out of the valley in the wrong direction. We thought it was a bit odd because they were not wearing race bibs and walking in the wrong direction. We kept descending down the tussocky slopes until we reached a nice hut, where we filled up bladders and the boys ate muesli and milk. By now I was finding it hard to eat anything because I had a very sore throat and my meusli bars were tasting particularly disgusting. I found plastic processed cheese slices to be remarkably tasty! We kept a good pace up the river and soon passed a snoozing team Mazda. Tim was just talking loudly about the virtues of canned corned beef so I shushed him as we crept passed. We reached the side gully which we knew lots of teams would try to use to access a pass which lead down to the control. We were very unsure about which route to take especially given the close contours in the side gully. When we got into the gully the stream immediately became a waterfall with cliffs on each side. Tim and I didn't take long to decide we didn't like the look of it, so we dropped back into the main stream and set off up that. Little did we know we were the first team to make the decision to head up this stream! The route up the stream was quite challenging and we had to find our way up slippery boulders and through tree fall. Team Mazda caught and overtook us again as we headed up the forest. Finally the forest became less and we emerged into an open gully filled with huge spaniards and prickly scrub! The pass we needed to climb didn't look far away but the travel was painfully slow. Most of the time we tried to bash up the slippery creek but sometimes we were forced in amongst the spaniards. Rob found it very painful on his sore foot. Finally after several hours of intense bashing we emerged on the saddle and looked down to see Team Mazda still stuck in the bushes. We quickly sidled over the pass and contoured round to the upper col. By now we were all starting to feel the effects of 3 days on our feet and we were a bit hobbly and sore as we descended another 600m down a tussocky river basin and found checkpoint 19 just as it got dark. Tim pulled a delicious can of spaghetti out of his pack and I gobbled it up, it was slimy, cold and yummy! We could see some lights on the hill coming down behind us so we hurried off down stream. We still had many kilometers and another 1500 m pass to climb and descend to reach the transition. Tim and I were both feeling a bit sleepy, but we were determined not to stuff up the navigation and paying close attention to where we were helped keep us awake. It was a cold night again and we had our thick fleeces on when we reached the saddle. It was a very steep descent down, with huge slippery tussocks all the way interspersed with prickly spaniards. We found the easiest way to get down was to slide on our bums, so we slid down bumb bump bump for hundreds of meters. I thought this made a pretty comical sight, but Rob was in a lot of pain and Elisha was feeling very sleepy so I don't know that they enjoyed it so much. In the river bed Elisha stumbled along half asleep with Rob helping him out. Tim and I were feeling remarkably awake, the map reading and sense of nearing the finish keeping us alert. Finally at the transition after slowly negaotiating the river terraces it was now about 2am. All the officials at the transition were up and eager to hear our story and even made us hot soup! Tim made a fantastic captain speech "we will organise our gear for precisely 20 minutes, then sleep for 30 and be prepared to leave on the dot at 18.45" Given it was 2 am this didn't quite make sense and Tim stammered..."Oh, that was my altimeter reading, opps!" We all cracked up laughing and set to with the task at hand. I slept in a the haybarn for about 20 before Tim woke us again. Elisha had about 30 minutes sleep and a Red Bull so he was feeling fired up and ready to go. We charged off down the road, Tim and Elisha so much so that I gave them a firm 'calm down' talking to. We sped into the first checkpoint in the dark, then made our way round the shores of lake Wakitipu on old 4WD roads. Rob was having a rough time, he was struggling to eat enough to keep himself going strong. He swiped out a contact lens and then he got a flat tyre. We fixed it for him while he had a power nap beside the road. We had a bit of trouble finding the way through to the checkpoint beside the lake - I found myself on a walking track. I got a bit frustrated with the maps - especially in places like that where they had gone to extra trouble to have a map insert and show all the detail but it was still incorrect! Tim gave me the creeps when he said "Don't worry Em, this is definitely right, I have biked on this map before!" I knew there was no way he could have biked here before and he was having a good dose of sleep deprived déjà vu! The bike ride went on for ages as we battled up valley into a strong head wind, then turned down wind for a while, then back up wind again. The Earnlaw burn of trek 3 sparkled up above us and I was sad we had missed out on the final trek (having missed the cut off the night before) but I think it would have been pretty awful for Rob with his foot so maybe it was just as well. We finally reached the kayaks in Gelnorchy and had a very relaxed transistion into them. I did try to hurry the boys along but they were faffing around in a happy state to be nearing the finish. Rob and I resolved to talk to each other constantly on the final paddle to keep awake, so our conversation drifted around the adventures we had had over the week. We saw the odd strange thing such as a baby face in a tree or a baseball bat in a cloud, but generally everything seemed right as we cruised in on a big tail wind and a good 1 meter surf to push us in to the finish. We collected the 2 checkpoints along the way and before we knew it we were grinning at each other as we neared the shores of Queenstown. We could make out a wee crowd on the beach and sure enough there was Chris. He finished the race a day earlier, doing the whole course and winning the race with team Seagate in 4.5 days. He was very pleased to see us and I was very happy to see him. We ran altogether through Queenstown up to the finish were we got a bottle of champagne and some pizza from the race organisers. 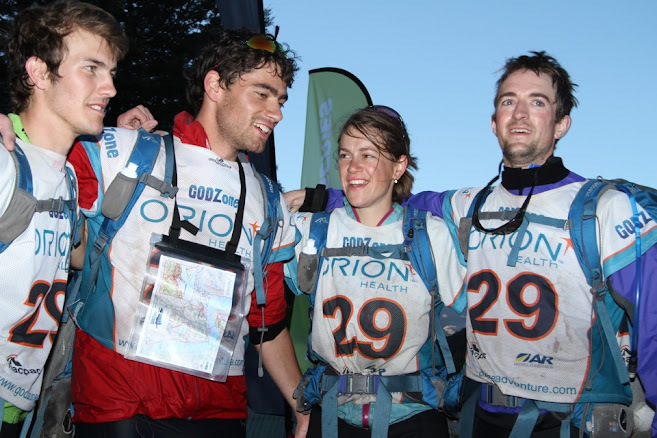 We were all so excited to be finished and it turned out half of our parents had all made a mad dash for Queenstown on Friday, having followed the race so closely online they came down to join the excitement. The Go Team finished very proud of the way we worked as a team and excited to do more! The following night the prize giving was held up at the top of the Gondola with an amazing view across Lake Wakitipu. It was really fun to catch up with everyone and compare stories from the race. I read it all, and I'm well impressed! Good work! What a great experience, Em. I am exhausted just reading about you and your team's efforts - you did really well, congratulations!